I thought this picture was adorable when i saw it! Nothin much, u? Bin going 2 school prom comeing up just got a dress lifes good. ^Yay! Prom!!!!!!!!!!!!!!! :) Have fun! Dance with a Robin look-alike! Red Arrow and Robin looked so shocked and Kalder is just like: dont talk to me! I can make out a scene! R:dont know, but she's scary! K:I know who she is and im not talking 2 her! wat show is that pic from? I donn't care what show it's from. It's so cute! And Robin looks completely adorable!!!! i like it better than the original pic. 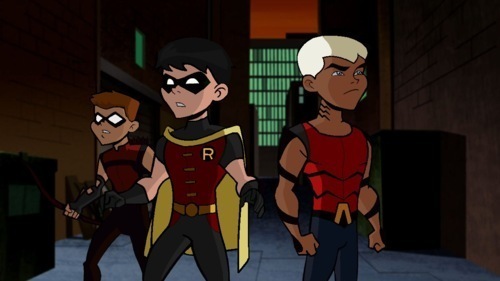 i do believe this is a remake of the pick of robin speedy and aqualad from batman brave and the bold episode sidekicks assemble.